FINAL TEXT: Deal Physical damage to target enemy and call another random Rebel ally to assist. Inflict Target Lock for 2 turns on a Critical Hit. If the allied Capital Ship is a Rebel, dispel all buffs on target enemy. FINAL TEXT: The Falcon dispels all debuffs from itself, recovers 50% Health and Protection, and gains the Outmaneuver unique buff for 3 turns (can't be copied). Additionally, it gains 35% Turn Meter for each Rebel ally and Empire enemy. FINAL TEXT: Deal Physical damage to all enemies and grant all allies Defense Penetration Up for 2 turns. This attack deals 25% more damage for each Dark Side and each Empire enemy. FINAL TEXT: All allies gain 10% Critical Chance, doubled for Rebel allies. The Falcon has a 50% chance to assist whenever another Rebel ally uses an ability during their turn. Whenever an ally reinforces, the Falcon grants them Accuracy Up for 2 turns. If that ally is a Rebel, they also gain Critical Damage Up for 2 turns. Additionally, when another Rebel ally is inflicted with 3 or more different debuffs, the Falcon dispels all debuffs on them. FINAL TEXT: Grant all other allies Foresight for 2 turns and call all Rebel allies to Assist. Additionally, reduce the cooldowns of the allied Rebel Capital Ship by 1 for all abilities except Call Reinforcement. Dispel on basic should work great against HT. Did they swap Ghost and Phantom on accident? Wow this ship looks amazing! Powerful, cool looking animations, and great ability names. Nice! Also, finally going to max Cassian and Bistan. Should be some nasty rebel fleets coming. And this had to mean we are getting Red 5 and a YWing, right? Right? 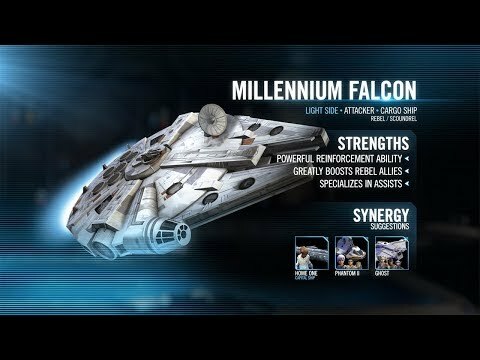 When do we vote on which ships we can use with the falcon for arena, TW, GA, etc? How does outmaneuver interact with stealth? If Han’s Falcon has outmaneuver while say, Ghost and Phantom have stealth (with no other allies), are enemies forced to target stealthed ships instead of the Falcon, or are they forced to attack the Falcon? I love this kit. Actually makes me want to invest more in ships. Finally we get a proper faction that works well with eachother. Falcon is to rebel ships what Bastila was to jedi. @CG_SBCrumb can you tell us why the ship has zero scoundrel synergy? With a seven star ackbar capital ship, we can now use every single of one faction in a battle, namely, all the rebel ships.
" If the allied Capital Ship is a Rebel" Leaving the door open for a new capital ship... let the speculation begin. Shouldn't the reinforcement instantly defeat Darth Vader's Advanced TIE? Power creep hitting ships now. Time to spend all my resources buffing my rebel fleet, fingers crossed he still buffs my fleet until my rebels catch up with my Bounty Hunters. I like it.. everytime when dolphins (not to mention f2p) are able to get some toons or ships, there will be released for sure a new paytoy for the whales to left all the others behind.. and all the lemmings are so happy about that.. Interesting question. I would also like to know the answer. I would assume that you would target the stealth ships like they were all stealth. Hope I can 7*, at 40/100 on both blood and 2000. I really like that they've made it super good, but only amazing in a rebel team with Ackbar etc. Feels like a shot in the arm for rebel teams, but without giving a super powerful tool to the already good teams. Home One is a Rebel Capital Ship. The enemies will target the stealthed allies over the OT Falcon.